Ah, the self-indulgent joy of making a podcast on one of my own passions. “They” say that turning cooking from an enjoyable hobby into a business is a recipe for disaster, and while I’m flattered that people will pay for an additional loaf of bread I’ve baked, there’s no way I’m going to be getting up at 3 in the morning every day to sell enough loaves to make a living. But there are people who have done just that, and one of them happens to be a friend. Suzanne Dunaway and her husband Don turned her simple, delicious foccacia into Buona Forchetta bakery, a multi-million dollar business that won plaudits for the quality of its bread – and then sold it and walked away. Suzanne was also one of the first popularisers of the “no-knead” method of making bread, with her 1999 book No need to knead. Using a wetter dough, and letting time take the place of kneading, has been around among professional bakers and some, often forgetful, amateurs for a long time, but it was Mark Bittman’s article in the New York Times that opened the floodgates on this method. Since then, as any search engine will reveal, interest in the technique has exploded, both because no-knead is perceived as easier and because the long, slow rise that no-knead usually calls for results in a deeper, more complex flavour. I’ve had my troubles with it, and had more or less given up on the real deal. But I’m looking forward to seeing how a quick no-knead bread turns out, especially now that I know that in Suzanne’s case it was the result of a delicious accident. 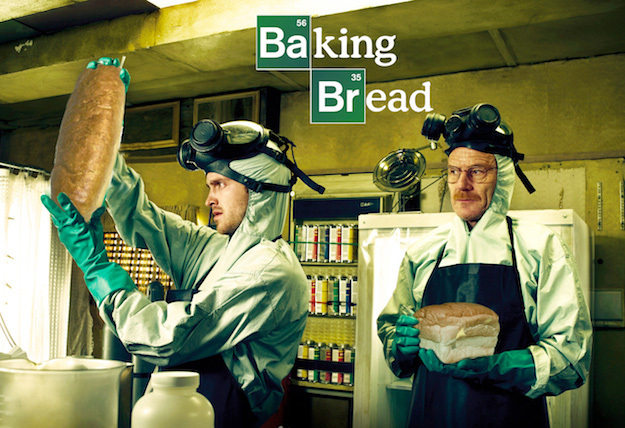 If you created the graphic riff on Breaking Bad, or you know who did it, please let me know. I would really like to give proper credit.